When I was born, like most babies, I was bald. My hair grew as I turned one and two. Then when I was almost three, I got Leukemia. Leukemia is a type of cancer that affects your blood cells. I went on medication that would help me, but chemotherapy made my hair fall out. It got shorter and shorter until I was bald. My parents and friends bought me lots of bandanas, wigs, and hats but I didn’t wear any of them. I was only three. I didn’t care if any one saw my bald head. I went to preschool bald and pretty much everywhere bald. Soon my hair grew so it was short and later it grew into thick red curls. I went through one more year of preschool, and then in kindergarten I had a relapse. A relapse is when you have cancer again after the first time. When I had a relapse, my hair fell out again and once again my parents and friends bought me lots of bandanas, hats, and wigs. Since it was winter, I chose a purple winter hat. I even wore it inside, but then spring came and my head got hot. My friend bought me a blue hat with clouds and a brim. I chose that gift to be my next hat. I wore it through the rest of kindergarten and all through first grade. Now in second grade, I still wear that hat. My story of hair is different from others but I act like a regular kid. My body looks no different from any other kid’s body, and I will always be myself. No matter where I go, I will always be me." 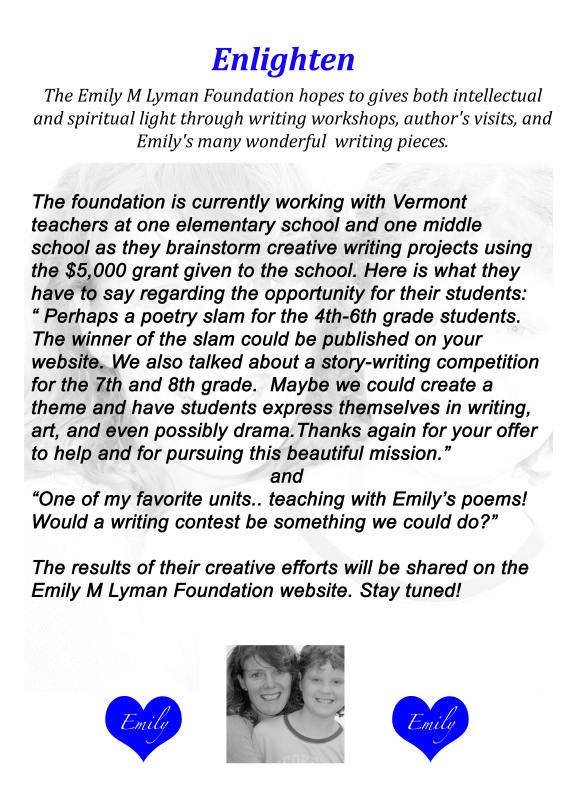 The Emily M Lyman Foundation paid for Tanya to spend the day at Mater Christi School, in Burlington, VT, where she talked with the middle school students about the writing process and how she researched her subjects. She then taught three writer's workshops throughout the afternoon.The students followed up on subsequent days to finish their creative writing pieces.